Mother Mary was already an Ascended Master at the time of her life with Jesus - as was St John, the Baptist. She feels it is very important we realise what her Ascension experience was like into mastery. In the life she made her ascension, she was a woman living a nomadic desert life with her tribe in the Middle Eastern area. Remember this was more than 2000 years ago, prior to her life with Jesus. Still she was dressed in a mid blue and there were tiny silver ornaments dangling from her veil. Her eyes were black and piercing. They looked wild and a little crazy. I was surprised by her eyes. She said, "Like Kuthumi, I had to go out of my mind, to come into my heart." She related how her father tried several times to marry her off, but on seeing her eyes the prospective bridegrooms departed rather quickly. After the last failed attempt to find her a husband, she left her family and tribe and wandered through the desert, slowly leaving the mind behind, becoming more heart centred. After a long period she remembered an area with steep cliffs that contained caves. She remained in the caves till her ascension as an old lady. Through her life time, word got out there was a holy woman living in the caves and seekers on the path would seek her out for tuition and guidance. At the end she had a small group of followers who lived in the caves with her, but much of her life was lived in solitude and prayer, becoming so heart centred she took the entire world into her heart to love as the Mother. Mother Mary is a third ray Ascended Master - the pink ray of unconditional love. 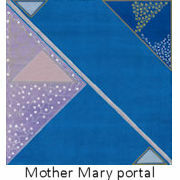 Her aura is soft pink with a border of mid blue, and then the band of white around the blue. All Ascended Masters have a band of white at the edge of their aura. The size of the white band depends on their level of Ascension - the higher they ascended the thinner the band of white. Mother Mary's is quite wide about 5cm. Her energy was very different to the energy of the Mother Mary we know today. Most of you will agree she has very soft, gentle, non intrusive energy. Yet in her Ascension life her energy was one of great inner strength and fortitude, qualities she took forward into her life with Master Jesus.